Courtesy of WOWSA, Tahiti and Mo'orea. 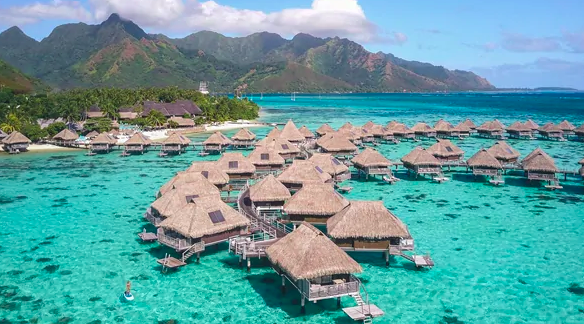 Staying at the Hilton Moorea Lagoon Hotel on Mo'orea before the 2 km, 5 km or 10 km ocean swims at the Tahiti Swimming Experience was an incredible experience. The food was excellent as can be expected at a 5-star hotel. The service and friendliness of the staff was also of world-class quality. 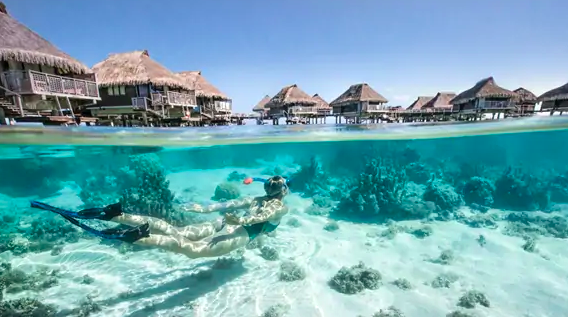 But for open water swimmers, relaxing and sleeping in very well-kept bungalows perched only a few meters above a turquoise-colored lagoon with a reef on the island of Mo'orea is a wonderful experience. 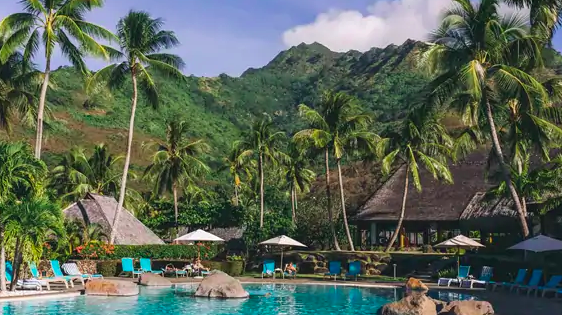 The ambiance of a tranquil ocean, the view of the deep green mountains in the background, the sounds of the birds, and the amenities of each room and the entire hotel was beyond anything that most swimmers have experienced. At night, the open water swimmers including world champion Aurélie Muller, French star Logan Fontaine and Olympic bronze medalist Marc-Antoine Olivier enjoyed a social function with the local ocean swimmers followed by a full-course meal when celebrated French Olympic coaches Philippe Lucas (2017 FINA Open Water Swimming Coach of the Year, coach of 5 Olympic medalists, 20 world championship medalists, 49 European championship medalists and 7 world record holders), and Stéphane Lecat (10-time world open water champion, French National Team Open Water Program Director, and 2018 recipient of the Irving Davids/Captain Roger W. Wheeler Memorial Award) shared stories of tough workout sessions, dramatic international races, and unknown comeback stories. On the morning before the races, a full banquet of foods from coconuts and breads to eggs and tropical fruits were spread out for the swimmers to enjoy. The Internet connection was excellent with routers in each room, but the individual balconies that enabled the swimmers to enter and exit the warm ocean from their own individual rooms and the individual saunas in each bungalow really were impressive. There may be no other better, more appropriate location for a relaxing night before a warm-water tropical marathon swim. The ambiance is perfect, especially in the company of an international group of swimmers. Saison 3 of the 2019 Tahiti Swimming Experience will include a 20 km cross-channel ocean swim between Ta'apuna on Tahiti and Plage de Tema'e on Mo'orea in October 2019.